With Photo Slideshow Maker Free Version , you can create photo flash slideshows in both SWF and HTML formats for watching on computer, burn the auto-run flash photo album to gift CD/DVD, or upload the slideshows to our free web album Go2Album, and then embed the slideshows to MySpace, Blogger, Friendster and many other social websites. 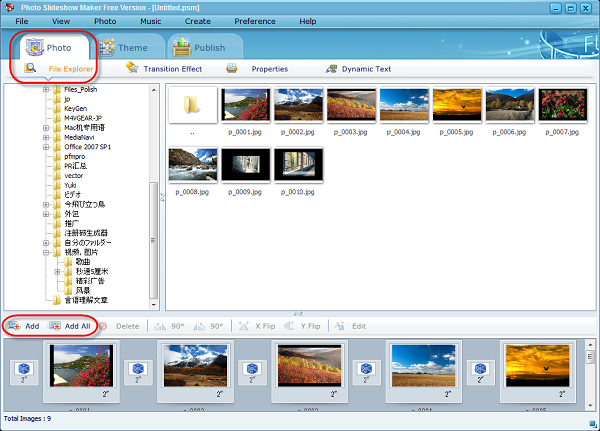 Start the Photo Slideshow Maker Free, open the window "Photo", click "File Explorer", you can search the photos folder, and the photos will be shown on the right window. Double-click on a photo to add or direct drag & drop photos to the Photo area. 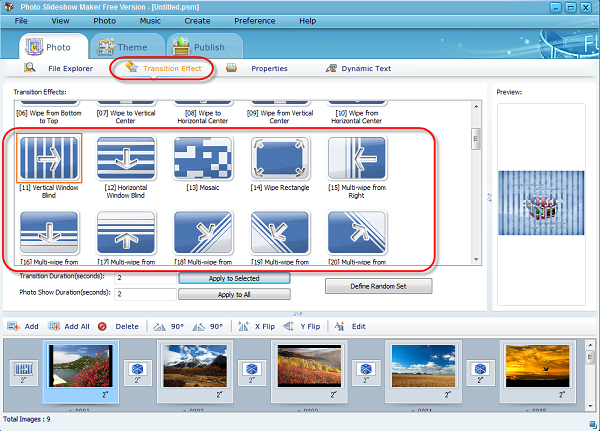 You can also just click Add/Add all button to add one or batch videos to Photo Slideshow Maker Free. 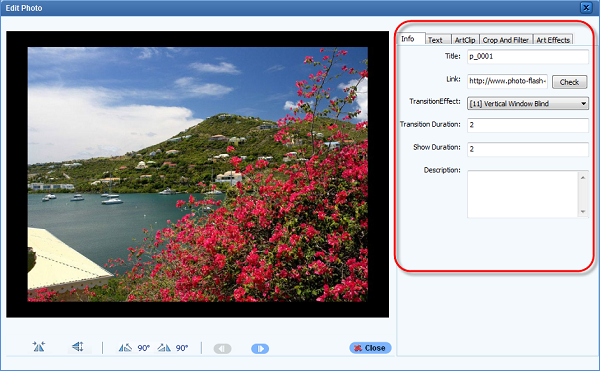 Then click "Transition Effect" to choose some effects to make your slideshow more fluent. Here you can add URL, title, description, text and art clips to the photos, rotate 90 degree of the pictures. Enter the "Theme" > "Basic" to choose from the 70+ free templates. Below the template list, click "Add(+)" to import music background. 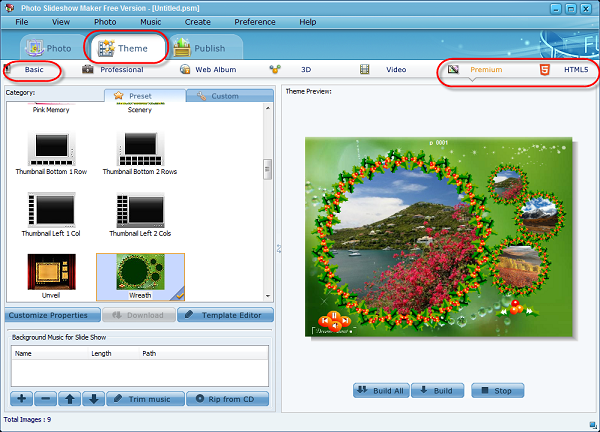 Photo Slideshow Maker Free offers only 3 different categories of templates. They are Basic, Premium, and HTML5 templates. 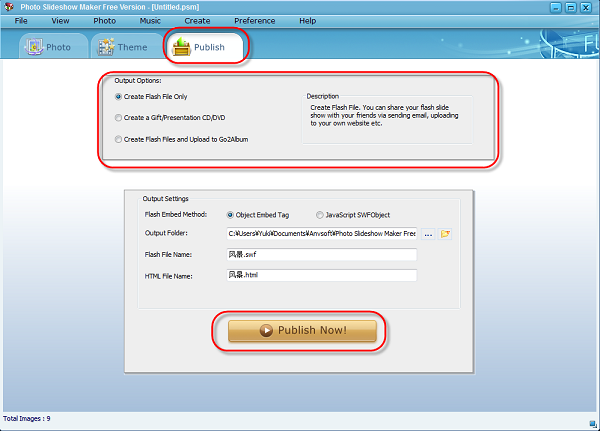 If you want to get more categories of templates, Photo Slideshow Maker Platinum is recommended. 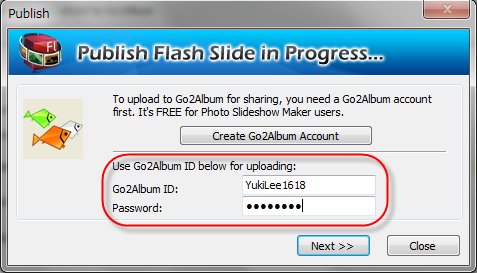 Choose to publish the photo slideshow as flash file only, to be burned to CD/DVD,then click the button "Publish Now! ",then you can enjoy your self-made Flash Slideshow right now! Or direct share it to our free online album Go2Album.com; You also can embed the slideshows to MySpace, Blogger, Friendster and many other social websites to share the fantastic slideshow. An all-in-one user-friendly DVD & video recorder, video converter, protection removal, YouTube downloader, video editor and DVD burner.